Will the former Chief Minister of Andhra Pradesh and former chief minister CM Kiran Kumar Reddy return to his home? Do you want to get Congress Tirth? That's the answer. Kiran Kumar Reddy met Congress president Rahul Gandhi in this regard. Rahul invited to his arrival, he said, adding that the state PCC should take charge. Reliable information. In fact, party sources have claimed that Kiran Kumar Reddy will return to the Congress with the suggestion of his political guru, former finance minister Chidambaram. Chidambaram has indicated that he should join the Congress. 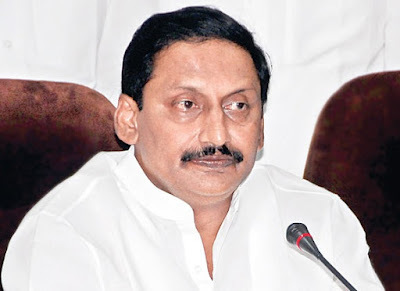 Kiran Kumar Reddy's involvement in the coming ten-month Assembly elections is likely to come in the next few days. He is likely to see Congress leadership's responsibilities soon. But the APCC president Raghuvar Reddy did not express his opposition to Kiran's return, but it was against opposing Congress's defeat. Raghuvira Reddy said that Kiran Kumar is not popular and that he is not a leader of Charisma and that he is the only Chief Minister of the country. After the partition of the state, Kiran Kumar Reddy has resigned from the Congress. The Jai Samaikyandhra Party was formed by contesting from the Peleroor constituency in the last election. Kiran Kumar Reddy is presently at the party and Naveen Kumar Reddy from Tirupati. Kiran Kumar Reddy's brother Kishore Kumar also joined TDP. Kiran has made it clear that he will not be able to reach the regional party despite offering a ticket from TDP. There was speculation that he would join the BJP. It was reported that BJP leader Purandeswari was in talks. But that does not mean that. Recently, Kiran Kumar Reddy, who came to his native village Nigiri Palli, had contacted his close friends. All of them have expressed consensus to join the Congress.